Worbla’s is the brand name for a line of easy to use thermoplastics popular in costuming, crafting and theatre. Worbla’s Finest Art was the first product, and if someone mentions just “Worbla” on its own, they usually mean Finest Art. Finest Art is a brown, opaque thermoplastic made from renewable natural raw materials, with an inherent adhesive and zero waste. Worbla’s line now includes sheet and pellet plastics, including Finest Art, TranspArt, Black Art, Mesh Art, Flame Red Art, Crystal Art, Deco Art, Pearly Art and Kobracast Art. Please see their respective pages here for more information. Worbla products can be cut with regular scissors, drawn on with pen or marker, sanded, glued with glues for plastics as well as hot glue, and painted with anything from acrylics to spraypaint. A heat gun is our most suggested method for heating Worbla products. To cut relief designs a hot knife can be used (with proper ventilation). Where can I buy Worbla? Check out our where to buy page. How should I store Worbla? Worbla’s products and leftover scraps are best stored in a dry, room temperature conditions. Keep away from sources of heat, and if stored in a cold area, allow the sheets to warm before working with them, as very cold Worbla sheets can be brittle. Worbla sheets are typically shipped in tight rolls. If you are storing your Worbla, we suggest unrolling them into something looser: if left in tight rolls they will be difficult to unroll later. If your Worbla is curling when you unroll it, clear a space and lay it flat with weights on each corner for 24 hours. This should help flatten it for use. How do you attach Worbla? To attach most Worbla products to one another, you can use the self adhesive that activates when it is heated. Simply press two heated pieces together to attach them – always heat both sides. You can also use hot glue, or epoxy-type glues, when the pieces are cool. For Worbla’s TranspArt, you can heat and attach pieces together but you may notice some warping of your final shape. For areas where a join needs to be visible and clear, you can use clear glues such as Cyanoacrylates / Krazy glue to join pieces. To attach finished pieces to costumes such as leg armor or shoulder pauldrons, you can use Velcro, leather strapping, and Earth magnets. How durable is Worbla? Can I use it for Airsoft or LARP? There’s no specific tensile rating for Worbla. It works extremely well for costume purposes, but we do not know how well Worbla would take that sort of impact damage. If you are designing something to take blows, keep padding in mind and consider building your pieces off of thicker foam as a core. Very basically, if you do it right and avoid a couple of pitfalls, Worbla LARP armour can be fun to make, not overly expensive, completely personalised, and relatively easy to repair if something doesn’t go as planned. Worbla is flexible, but can become brittle if that flexibility is removed. It’s also quite thin, which means that larger structures need to be supported to make them workable, which then removes a lot of that flexibility. I would advise you to stay away from making large or flat structures such as helmets or breastplates, as these may crack or split if shock-loaded with weight (i.e., when you fall on them, or when struck hard), and this could lead to potential injury. If you’re confident that you can create something safely, feel free to give it a go, but I’d personally avoid it, and stick to smaller pieces like bracers and greaves, or using the Worbla for constructing scale or splint mail. How strong is Worbla? Can I use it to build a very large prop? Worbla is strong, but is not made to support weight in itself and can snap if too much weight is placed on one area. If you need to make something large you are best to use a core of foam or pvc to support the weight. Large, long props or accessories that need to hang from a point on your costume will need a large base of support, or the weight will make the plastic bend. What sort of foam can you use with Worbla? For the sandwich and backing methods many people use foam sheets you find in craft stores – usually called fun foam, craft foam or foamies. You can also use thicker foams – such as what yoga mats or garage flooring are made of, often called EVA foam, or L200 foam which is commonly used in theater and stage work. You can also use the hard pink insulation foam, or expanding foam, and carve shapes that you then cover with Worbla for additional strength and rigidity. Sandwich method? What is that? Worbla’s sheet plastics, if shaped by hand completely, can end up uneven or lumpy. A way of keeping it smooth is to back it with a thin sheet of foam. For extra strength, sometimes the foam is sandwiched between two pieces of Worbla, especially useful for pieces that will be under high stress. We have a tutorial explaining the process here. You can also use a method called the folding method, or combine both, depending on the strength you need and your budget for the project. How do I make a pattern? We have a few tutorials regarding pattern making! Check out the videos and writeups on the subject for more information. The best way to see how much you need is to make your pattern first. Then you lay your pieces out as close as possible together, measuring around them to see how small a sheet they will all fit onto. Remember if you’re sandwiching you’ll need double the amount. A visual guide is available here. Can I take Worbla into the pool? Lake? Sea? Well, that depends on several factors. Worbla itself is fine in water, though it’s suggested you rinse your pieces off afterwords to remove salt/chlorine. If your Worbla is wrapped around foam with open areas (such as the folding method) then you may have more issues with the foam reacting to the chlorine/salt water, and remember that your paint will be what is the most affected by the water. Make sure your paint is waterproof and well sealed. Can I use Worbla for an Aquarium? Pond? Garden display? Worbla hasn’t been tested for long-term underwater use, but we expect that it will behave as most plastics do. It’s suggested that Black or Pearly Worbla be used for water features, as they are less porous than Worbla’s Finest Art. All Worbla products are generally safe for the outdoors, though Wonderflex is suggested for pieces that may be left to the elements for very long periods of time. Keep in mind that heat can effect Worbla (as noted below). Will Worbla melt in the sun/desert/really hot day/at my LARP/on Mars? Costumes made of Worbla will generally manage the heat of outdoors, though pieces can get a bit soft in extreme temperatures and cosplayers in extreme heat for extended periods of time have reported large props or pieces starting to ‘sag’. Worbla shaped free-form (without any core or backing) will likely react in heat faster than Worbla shaped over a core. For large props and other work, we don’t suggest using Worbla alone if it will be left outside or under direct sun, and to build with a core for support. Always consider temperature ranges before working with Worbla for outdoor displays. Can I attach Worbla to metal/wood/foam/fabric/leather/bone? Yes. Worbla products can be joined to any material. The natural adhesive in Worbla’s Finest Art or Black Art may be enough, but using a glue is strongly suggested. Contact Cement, Barge-type glues and epoxies all work well. Always test your glue on both materials and follow safety instructions. All of Worbla’s Product Line are Non Toxic, contaminant free and conform to ASTM D-4236*. However, Worbla products are not tested for use as mouth appliances. Worbla’s Kobracast Art and Pearly Art have not completed ASTM D-4236 testing at this time, but both are non-toxic and contaminant free. Can Worbla be laser cut? Yes! 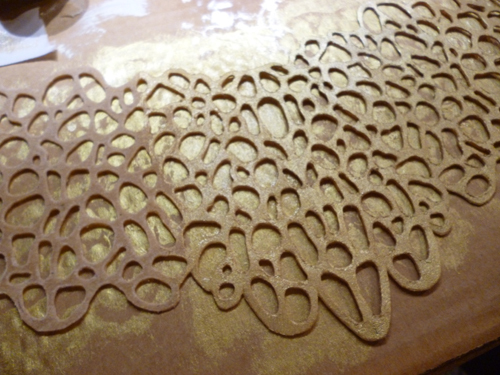 Worbla products can be cut using commercial laser cutters well. You’ll need to test to see what settings work best for you. Please refer to our pages on laser cutting here. Do you have MSDS sheets for Worbla Products? Yes, please email Amanda@worbla.com for the MSDS sheets.